The huge size of Australia is as overwhelming as the long roster of attractions and activities it offers. The country is gifted with everything adventurers love, from mountains and forests to beaches and bushlands. Add to these the urban cities and accommodating people, and tourists would elect Australia as a destination worth coming back to. 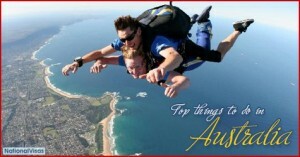 Discussed below is a compiled list of the more than 100 things to do in the tourist-magnet Australia. A top ranker in the to-do list in Australia is an inter-regional nature trip. With several unspoilt locations, the country offers natural sites that can enliven the senses of any soul-searching traveller. First on the list is the unparalleled Great Barrier Reef with its mile-long coral formations that can even be seen from outer space. There is the Victorian Alps to give a high from atop the highest point of the country. This mountain range that stretches across three regions (the ACT, New South Wales, and Victoria) is home to the Snowy Mountains, the Alpine National Park, the Namadgi National Park, and the Tidbinbilla Nature Reserve. How about taking pictures with the cute animals found in those mountains and nature reserves? Australia has koalas, kangaroos and wallabies, the smallest penguins, whales, dolphins, numbats, Tasmanian Devils, kookaburras, flightless emus, black swans, and echidnas, among many. For a picture of the country’s diverse fauna, there are 140 species of marsupials, 828 species of birds, and 4000 species of fish, among other types of animals found in the continent. So, whether visiting a wildlife park or a zoo, make sure to get eye to eye with any of these animals mostly found in Australia. To travel Australia for real means to ride a horse or dirt-bike in the wilderness, to swim with the dolphins and whales in the ocean, to toboggan and ski on the snowy peaks, to four-wheel-drive across the desert, to skydive for a bird’s-eye view of cities, to rock-climb on Ayers Rock, and to drive long distances to discover towns and culture along the way. There are numerous high-octane activities in Australia, but those who prefer the laidback can either visit wine plantations and drink some of the finest liquor in the wine regions of Western and South Australia, or visit botanical gardens and parks for a refreshing breather before heading home for the day. Australia’s organised and interlinking transport system invites travellers to take in much of the city. Every region has its own central business district where notable attractions shine with camera flashes: the Sydney Opera House and the Harbour Bridge in Sydney, the Eureka Skydeck in Melbourne, the Remarkable Cave in Hobart, the Story Bridge in Brisbane, the Water Labyrinth in Perth, the Parliament House in Adelaide, Cocosaurus Cove in Darwin, and the Mount Ainslie Lookout in Canberra. Australian CBDs are also famous for shopping and dining, and visitors must wait as they transform at dusk to offer electrifying nightlife to locals and tourists alike. Drink at pubs or watch theatre shows to experience the country at night, or if lucky, attend a concert that takes place often in cities. The National Gallery of Victoria, Queensland Art Gallery, and the Art Gallery of New South Wales are the three most visited galleries and museums in Australia. Museums in the country have a wide collection of Australian Aboriginal artifacts as well as ancient and contemporary pieces of both local and international origins. Enthusiasts will delight at thousands of pieces found in over one thousand museums operating across the country, including historic objects (furniture, textiles, and ceramics), natural science specimens, and films and photographs of cultural significance. For a memorable twist, brave adventurers can also head to some former gold mining towns to experience a ghost-town feel, or drop by old cities to behold colonial European architecture. All these attractions and activities are available for the taking, but a travel to Australia must be done legally with a tourist visa or a working holiday visa. National Visas has expert registered migration agents to assist in visa application and provide essential tips for surviving and enjoying Australia. With the help of National Visas agents, real-life adventurers can focus more on their big adventures ahead.